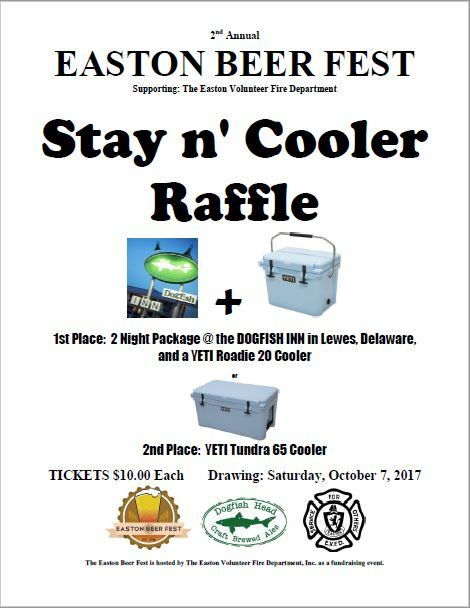 The Easton Volunteers, as part of the Easton Beer Fest are holding the STAY n’COOLER Raffle. The 1st Place prize, a 2 Night Stay at the Dogfish Inn in Lewes, DE, with guided Brewery Tour at Dogfish Head Brewery in Milton, DE, preferred seating at the Dogfish Pub in Rehobeth Beach, DE and a YETI Roadie 20 cooler to carry your favorite craft beer or drinks. The 2nd Place winner will receive a YETI Tundra 65 cooler, big enough to keep a few cases cold for days. Tickets are available from any EVFD Member or at Harrison’s Wine & Spirits, North Harrison St, Easton (Across from TalbotTown). Drawing will take place at the Easton Beer Fest on Saturday, October 7th.